FlockFiler Go is a free add-on to FlockFiler Pro supporting iPhone, iPad, and iPod Touch. Supports iPhone, iPad, and iPod Touch running iOS 8.1 or later. Browse and search records. Data entry is not yet supported. FlockFiler Go consists of two files: one is added to your current FlockFiler installation, and one is installed onto your iOS device. Update to the latest version of FlockFiler. This supplemental file has only been tested to work with FlockFiler Pro 1.1.2. Download the file: FlockFiler_Go_Desktop_100.zip (0.1MB) or FlockFiler_Go_Desktop_100_FM14-32.zip (0.1MB). Uncompress this zip archive and place the "FlockFiler_Go.FFP" file into your "FlockFiler" folder or the "FlockFiler_Go.ffp12" file into your "FlockFiler32" folder. It should sit next to your FlockFilerCentral.FFP, FlockFilerLiteData.FFP, and FlockFilerProData.FFP files in the "FlockFiler" folder or your FlockFilerCentral.ffp12, FlockFilerLiteData.ffp12, and FlockFilerProData.ffp12 files in the "FlockFiler32" folder. Get the free FileMaker Go 14 app from FileMaker, Inc. for your iPhone, iPad, or iPod Touch and install it onto your iOS device. Using your iOS device (iPhone/iPad), download the file FlockFiler_Go_iOS_100.fmp12 (1.4MB) and choose to 'Open in "FileMaker Go"'. Choose the new "FlockFiler Go..." entry in the File menu. A new FlockFiler_Go window will open. Push the "Generate Data File for FlockFiler Go" button. FlockFiler Go will locate your Current records in FlockFiler Pro, assemble data from them, and save the data to your FlockFiler Exports folder as "FlockFilerProToGoData.zip". This file needs to be sent to your iOS device. A dialog will come up offering to e-mail the file. (This is useful if you have an e-mail client set up on your computer, and you can receive e-mail on your iOS device.) Upon opening the zip file attachment on your iOS device, choose to "Open in FileMaker Go" to complete transferring the data file "FlockFilerProToGoData.html" to the file storage area of the FileMaker Go app. If you do not want to use the e-mail button, you can send the data file to your iOS device by any convenient file transfer means e.g. sending the file yourself using your preferred e-mail method or your preferred "cloud" storage solution. Depending on the specifics of your service, it may be necessary to uncompress the zip file and transfer just the "FlockFilerProToGoData.html" file contained within. You can use iTunes and sync the "FlockFilerProToGoData.html" data file to your iOS device instead of using e-mail or network file copying. To do this connect your iOS device to the computer and launch iTunes. Copy "FlockFilerProToGoData.html" to the file are of the FlockFiler"Go app. Then perform the iTunes sync. Under Windows 10 (and possibly other versions of Windows) the first time you push the "Generate Data File for FlockFiler Go" button under Windows, a dialog may pop up (show image) asking "How do you want to open this file?" in reference to opening a .vbs file. 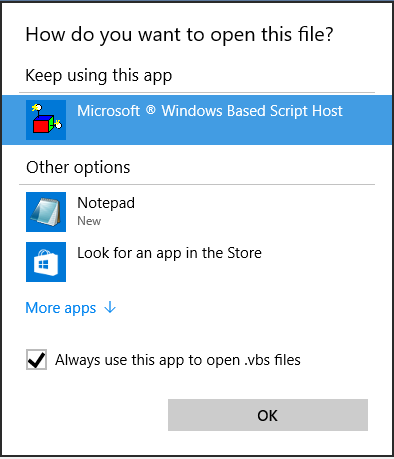 Choose to use the built-in Windows program "Microsoft® Windows Based Script Host" and make sure that there is a checkbox next to "Always use this app to open .vbs files". Because of this dialog, the first time you pushed the button, the zip file will fail to be generated. Subsequent button pushes will work without problems. This .vbs file is needed to provide the programming to generate a zip file under Windows since Windows does not provide a built-in standalone program that FlockFiler Pro can use to perform this task. In the FileMaker Go app on your iPhone or iPad, open the FlockFiler_Go_iOS_100.fmp12 file. Touch the "Sync" button at the top of the screen. This button automatically appears if FlockFiler Go detects that there is a data file to read. Data read from the file will replace any previous data in FlockFiler Go. If this button is not visible on-screen, touch the folder icon at the upper left, touch "Scripts", and then choose "Read FlockFiler Pro data file". FlockFiler Go will take some time to process the data file and create the records in FlockFiler Go.